The X-RAD 320 is a self-contained X-ray system for delivering a precise radiation dosage to specimens in a biological or small animal research laboratory. The shielded cabinet includes an Adjustable specimen shelf, Sample viewing window and Beam hardening filter holder. The TouchRAD control panel is a multi-user, password protected touch screen interface with a transportable database that can track individual system usage. Passwords, programmed exposure settings, and database management are controlled by a super-user. The X-ray tube is used specifically for radiation therapy having a highly homogenous beam. Options available include: Dose measurement & control, Motorized specimen shelf, Turntable, Fixed beam collimators, Adjustable collimator, and Specimen holding fixtures. 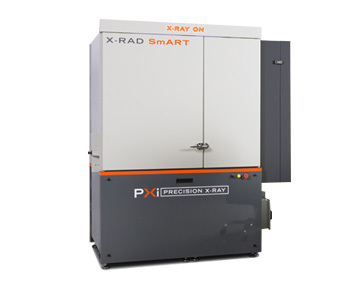 Precision X-ray is the leading provider of safe, high output X-Ray irradiators used in modern translational research.